Here comes Jaya! This Indian name has many meanings, in Sanskrit Jaya means victory; it is also the name of a famous mountain in Indonesia, Puncak Jaya actually. However, the true meaning of this name is a secret woman, who is reserved and careful. She does not show to much of her emotions or her feelings and prefers to keep cold headed. She is also very determined, mature and will work rigorously to get through administrative procedures to achieve her goals. As some of you may have notice or who know India very well, I decided to choose a girl from the south instead of the north, meaning someone darker who lives in the Tamil Nadu region, which is closer to Sri Lanka. 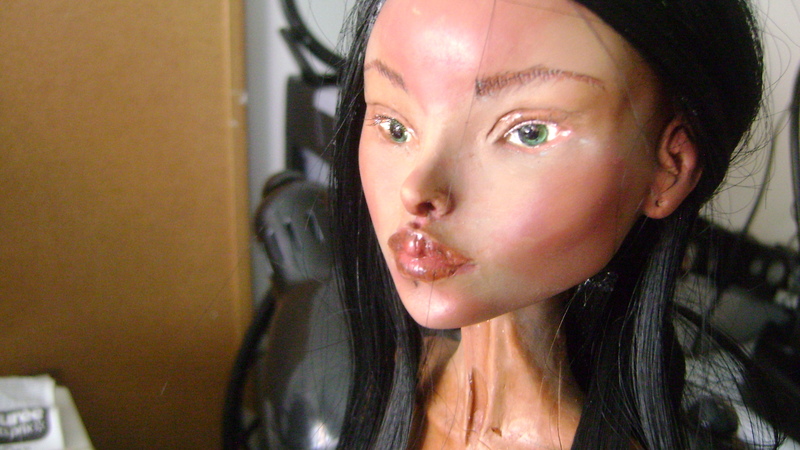 My doll Jaya came alive in late October of 2014 and was sculpted from a mix of different brands of polymer clay: Prosculpt, Living Doll and Fimo Soft. In my opinion, this mix was to soft and malleable while I was working with it and had to work quickly with it since it become sticky in a short period of time. The next step was to let the clay rest for two days; otherwise I could not work with it properly and would lose patience with a soft clay, which did not permit me to mold specific details: nose, fingers, toes, eyes and ears. 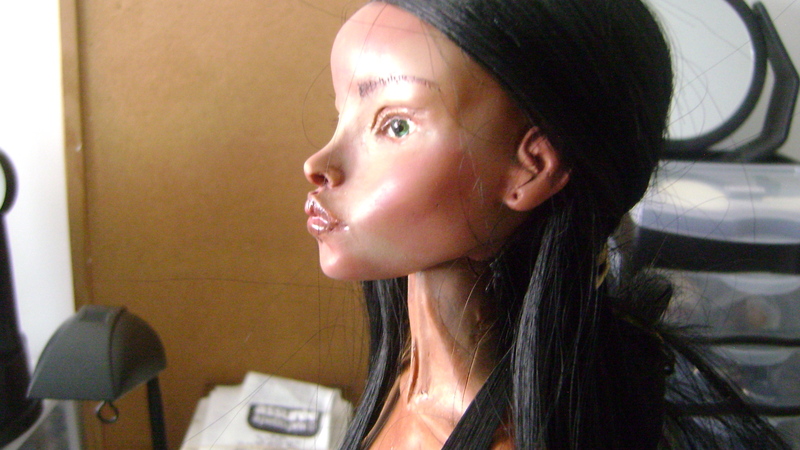 Sadly, I sensed something would go wrong with this doll and at the end I was right, because a few fissures appeared on her body, especially on her arms and behind the neck. You can be sure that I will never be using this combination of this mixes of clays ever again, though it was a nice try…and really do love the way I sculpted her. 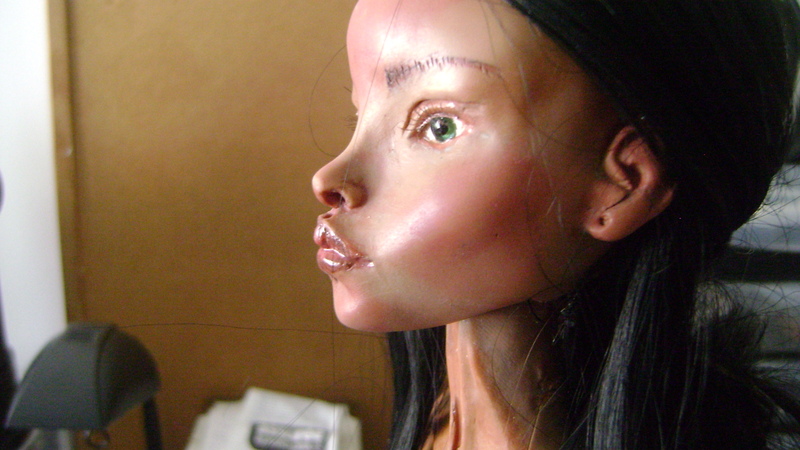 To finish with this post, her green handmade glass eyes were made by me and her wig is made out of black human hair. 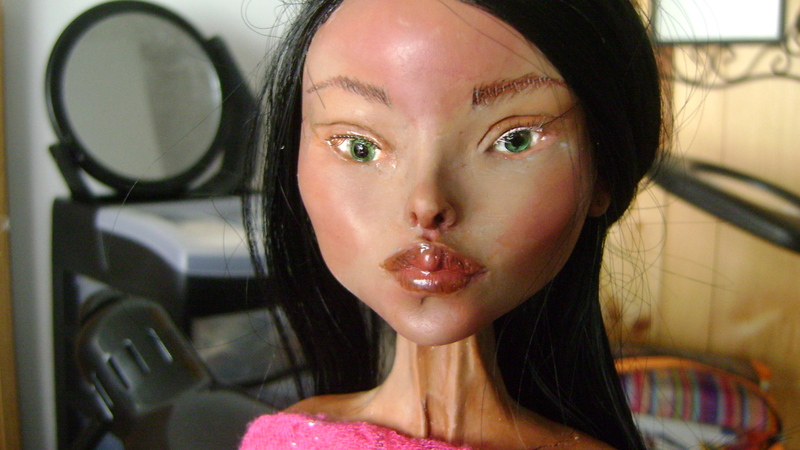 Thanks for your interest in my dolls, all you doll lovers! 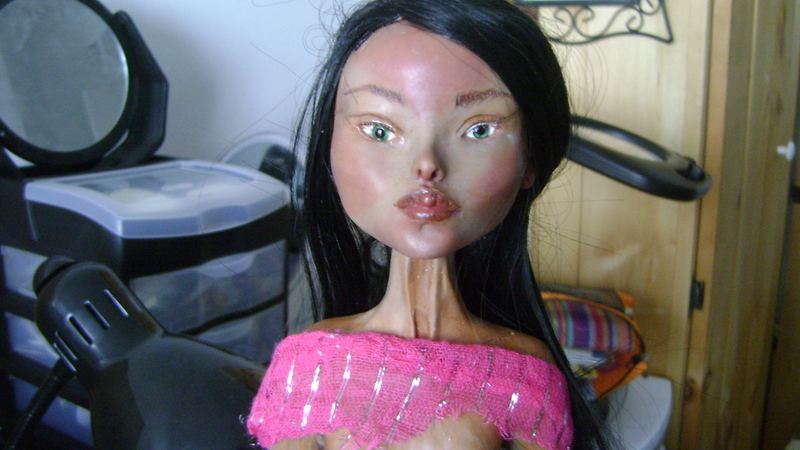 You may have notice there is a huge crack around her neck…this is due to the mix of (fimo soft/ prosculpt & Living Doll) and it was not a good one! Because of his softness, it could not support the strong wire armature that I made for this doll. 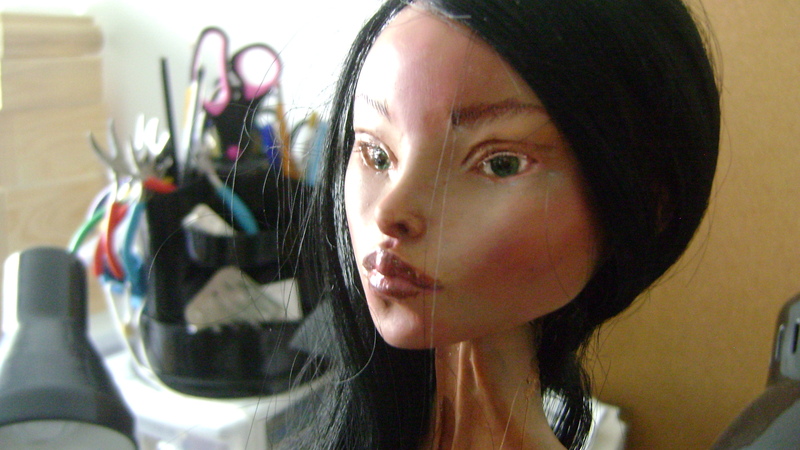 It is so sad, since I really do like this doll sculpt, but one thing is clear, I can’t use this mix! 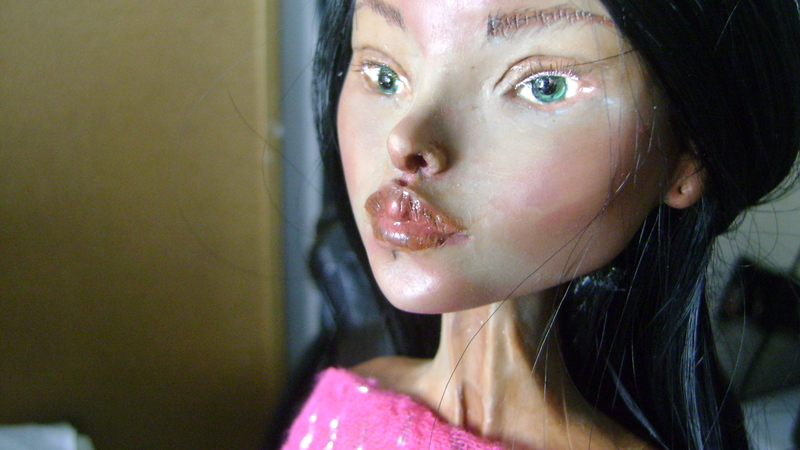 I want high quality and the best for my dolls!